The colour black is my one true clothing love and I wear it most often but I just can't resist green. 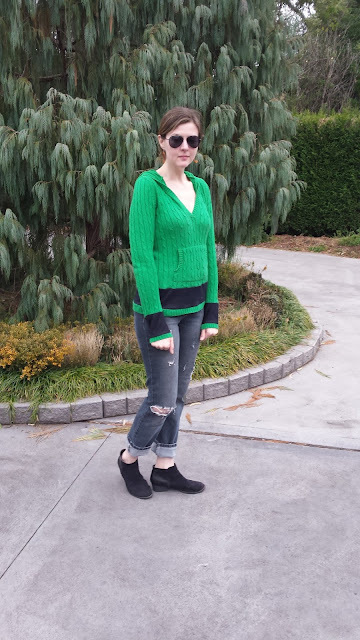 Emerald, Kelly, whatever you call it - I love it! When I was in the USA a few years back and saw a fabulous green hoodie on clearance at Old Navy for less than $10 I had to have it. Sure it was a little short, but I told myself the lie that every tall girl tells herself... it's not that short (unless I move!) & I can stretch the sleeves. Then it shrank in the wash. Whoops. So rather than give it to a short friend I decided to make it work by doing some colour blocking with navy Ponte fabric I had left over from making this midi skirt. Cut off the wrist bands and bottom band - carefully as it will fray! 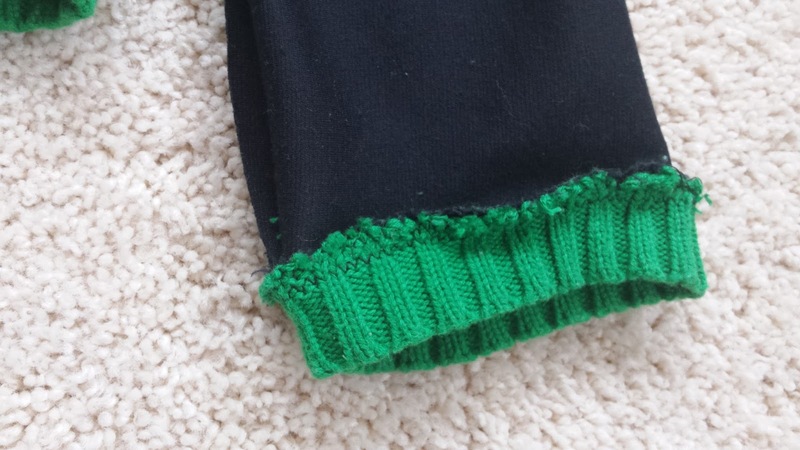 Sew in fabric which is the same width as the original piece and your desired length. If the top you are adding to is a stretch fabric, then add in stretch fabric. If it's a woven fabric, then use woven fabric. 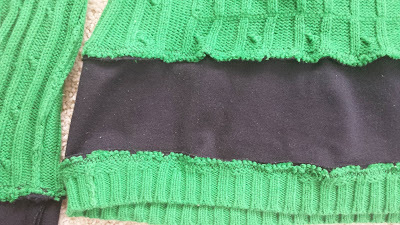 Use a zig zag stitch if your top is stretchy and finish the edges. A little tip: make sure your wrist bands are the right way around when you reattach them. One of mine is backwards which bothers me, but not enough to fix it! Ta da! Now I have a colour block hoodie which actually fits. I don't know about the other tall girls out there but I feel much more comfortable when my sleeves are actually long enough! This is such a great idea! My daughter is tall for her age and the length of her shirts/dresses is a problem. This is a perfect (and cute) fix! Thanks Ruth!! My eldest daughter is tall & thin, so her clothes get too short but still fit well in the body. I use this technique for her too & have cut the bottoms off old (stained!) t-shirts to use to add length. What a gorgeous green colour! Love it!